One of the many topics I love to cover in my posts is the world of the female pro cyclist. They receive so little coverage compared to their male counterparts that I feel it’s part of my responsibility to help. Plus I really love to interact with them. I first spoke to Kimberley Wells three years ago so thought it was about time we caught up with her. Kimberley and I exchanged a few emails for this interview…..
Q: What are you up to Kimberley? A: Racing up in Belgium at the moment. Ran 7th in the Dwars Door Vlaanderen (a race that is trying to get UCI status – maybe next year) a few days ago, then did a Belgian National level kermesse and won that. It’s all happening up here. I’m racing in Europe for two months with the High5 Australian Development team (national team) and then will be racing with my pro team in USA (Colavita/Bianchi) from the Tour of California onwards (May 19-22). Our team managed to avoid the Brussels attacks despite being on our way to the Brussels airport to collect a team mate the other day. The Belgians are a tough people and we’d all like to pay our respects. Q: We last caught up with you about three years ago, what’s been happening in your cycling career since then? A: I had a stellar time in 2013 racing for Fearless Femme in USA as the Australian criterium champion, winning many races and learning so much from great people. Summer of 13/14 wasn’t good for me – I missed the entire Summer of racing, being sick with pneumonia. It broke my heart not to defend my national title, and then miss out on racing with the Australian team in Qatar. But with Sara Carrigan as my coach, I picked myself back up again and trained to race with PC-Futuroscope, a French team with Sarah Roy. I joined the team in time to start my first European race at Tour of Flanders! That’s the deep end of the pool. A World Cup in Belgium over some of the most iconic cycling terrain you can choose. But it wasn’t to be as I was injured in a race the following day, which ended my entire European season. A torn piriformis muscle forced me to return to Australia and not exercise for four months. Cycling can be the most jubilant and the most soul destroying sport. I felt destroyed. Two months with pnuemonia. Retraining. And then 4-6 months of limited sport and constant rehab. Gutted. 2014 was a write off. I spent the 14/15 Summer working with ACTAS (ACT Academy of Sport) focusing more so on track cycling – an area where I know my strengths can be well utilised. I won a silver at the Australian Omnium nationals and in the scratch race at the Oceania Track championships. But the fit wasn’t right and it wasn’t the right environment for me to achieve my goals, so I closed that chapter, which at the time was an agonising decision. I raced well over Summer with the vengeance of lost time and won all the main Aussie criteriums leading into Christmas (Noosa, Launceston and St Kilda Super Crit). The trifecta. And then iced the cake, winning back my Australian National Criterium title. That was redemption for me. Having been unable to show my strengths racing in Europe and then carrying an injury I was without an EU team for 2015. No one wants to know you when you’re injured. But I picked up with the newly minted High5 Australian NRS team, spear headed by Rochelle Gilmore. We were the most successful team in the NRS and notched up many victories. Ultimately I wanted to be racing overseas. I went to the infamous AIS-selection camp, modelled on SAS selection strategies. A “break them down” and see what they have left style of selection. How do you measure resilience? I made it through the camp and was successfully awarded the Amy Gillett Scholarship 2015, allowing me to race in Europe with the Subaru/High5 Australian team (also you tube videos – Mr Challenge Films). In Europe I made it onto the podium in UCI events and then topped off the campaign, coming first on a stage in Trophee D’Or. Our success over there lead to my pro contract signing with US pro team Colavita/Bianchi for 2016. A huge relief to sigh with such a supportive and enthusiastic team. Q: I’ve read that you’re aiming to represent Australia in this year’s World Championships in Qatar. Given the depth of the Aussie women, what are your chances? 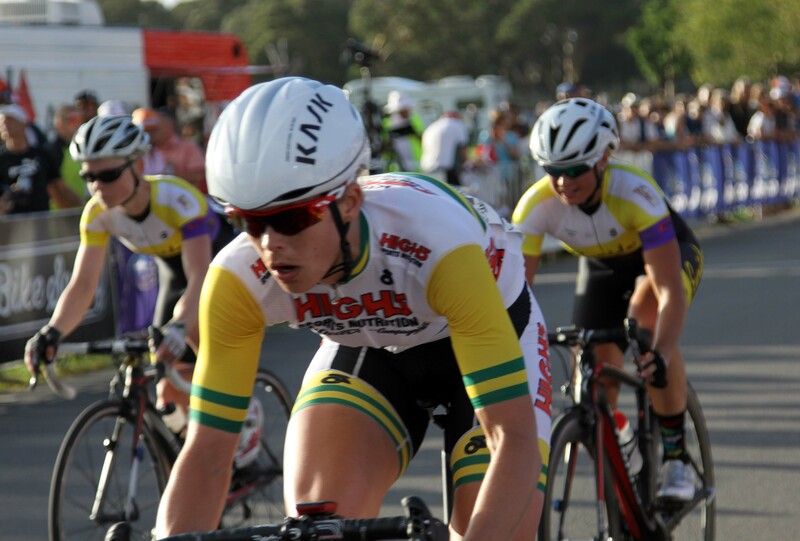 A: It’s great that there’s such depth in the Aussie Women’s cycling at present. There are a number of contenders who can contribute to a successful Qatar World Championship campaign. The Qatar course will be flat and windy and suits the strong riders and sprinters – a completely different course to the Rio Olympics. 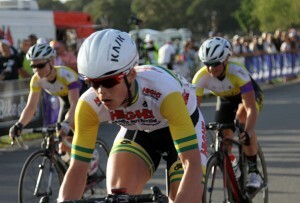 As a sprinter I am pushing towards racing for a rainbow jersey for Australia. That would be huge. But there’s much racing to be done before October. Q: What does a typical week of training look like for you? How many hours do you spend on the bike? Do you do any other cross-training? A: I am coached now by Stu Shaw (husband to Gracie Elvin Orica-AIS) who enjoys hurting me on the bike – he says it’s helping. I train anywhere from 1 hour to 5 hours a day on the bike with varying training goals/intensities. It’s a big commitment to train like that and give yourself ample time and opportunity to recover. I like to be busy, so I always have to work on doing less to recover better. I enjoy some time on the MTB with my husband, Doug, as it fits with my schedule. Gym strength work is also good for cyclists. Q: If a random person asks you what you do for a living do you answer pro cyclist or doctor? That depends who is asking the question – either or both answer perplexes a few and I have to explain myself. The doctors and nurses at work all know what I’m pursing and are enthusiastic and supportive, which is great. It’s a tricky juggle as both are fulfilling. Q: I’m guessing that life after cycling will be a career in medicine, do you have a time-frame for that career transition? I’m not sure that I’ll ever have a life post cycling; cycling will always be a part of my life. When I’m not racing pro any more, my full energies will be towards a specialty in medicine. Q: How often do you get to see your husband and family & friends? A: I have a great girl squad to be part of in Canberra so I see them a lot over Summer. My family mainly reside in Adelaide & Hills, so I see my parents, brothers and siblings mainly around Christmas. And I see as much of my husband, Doug Lampe, as I can when I’m home. His new job with Deloitte involves considerable travel so we both know what it’s like to be on the road. But that forces us to communicate better with each other across the distance. Thanks Kimberley. We hope you have an awesome 2016 as a female pro cyclist. A great role model for others.